Why should anyone follow me? My previous blogs have focused on Strategic Thinking where I have outlined what it is and how developing an effective strategy may be best approached. This addresses the “Where am I going?” question and is often relatively easy because it usually involves only a small team of senior managers – the architects of the strategy. Once it comes to Implementing Strategy, the whole organisation needs to be involved, and aligned, which presents a different level of challenge. This addresses the “Why should anyone follow me?” question – the engagement. 4. They can see that they have the capability to support the implementation or can see that they will receive sufficient support to develop their capability. 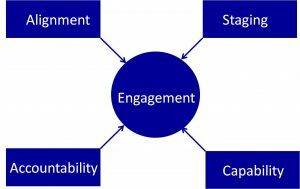 This blog provides guidance on how to provide detail in these 4 areas and thereby get engagement with the implementation of your strategy. 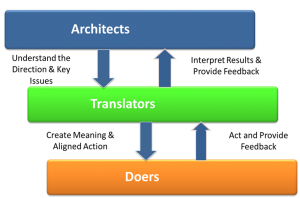 Fundamentally, in the implementation of strategy, there are three key roles: Architects, Translators and Doers. Architects are the senior managers who develop the strategy and Doers are those who implement the strategy. In between sit the Translators, who have the crucial role of understanding the strategy (even though they haven’t been involved in its development) and communicating it to the Doers. To increase your chances of a successful implementation, there must also be feedback loops throughout the organisation as to what is and isn’t working. In other words, the strategy has to have a ‘Golden Thread’ up and down the organisation. This is not just about communication, it is also about translation into meaningful activity; there has to be accountability for who will do what, and when, to implement the strategy. This is realised through objectives and measures that are integrated into an overall strategic plan. It’s not rocket science, in fact it is common sense, but is often not common practice. I regularly meet people in organisations who are not clear about what is expected of them and, as a result, are less motivated and aligned than they could be. Strategy needs to be communicated over and over and over again, to the point where many senior managers feel that they are repeating themselves, which of course they are! Every employee should be able to repeat the strategy and understand how it applies to their day to day work. 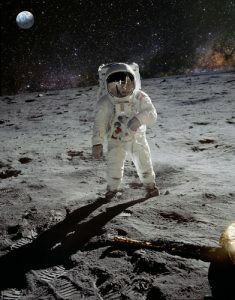 There is a myth that, in 1967, the cleaner in NASA, when asked what he was doing, replied “helping to put a man on the moon”. Compared to this, I rarely find that even middle managers in organisations (the Translators of strategy) are able to articulate the strategy clearly, let alone the Doers (the cleaner in the NASA example). How the strategy will be implemented also has to be clear and make sense. This is the Staging: what will happen first, and subsequently; what are the key milestones? It’s all very well having a vision and strategy but this needs to be believable and achievable. In the 1990s, I worked for a UK telecoms provider that had a vision “To put PIE (People, Information and Entertainment) in the palm of the hand”. At that time, it was only a small provider with little expertise in these technologies, limited resources and little global reach. The vision was a grand one but there were no practical steps to achieve it. Needless to say, this attracted a lot of cynicism within the organisation and the vision was eventually abandoned as it gained no traction. Now, this vision has been achieved by many organisations, led by Apple, through the Smartphone! If you are asking an organisation to do something new, then you need to be sure that the capability to do it exists within the organisation, both collectively and individually. What new systems are required? What new skills are required? Will those new skills be recruited or developed from within the organisation? How will this be managed? I have found that almost all strategic initiatives involve new IT systems and the development of these new IT systems is critical to obtaining competitive advantage. This is just one of the capabilities that may need to be developed to ensure successful implementation. 1. Get alignment through clear communication up and down the organisation – maintaining the golden thread. 2. Make the strategy believable and achievable through clear staging of the implementation – a strategic plan. 3. Help people to be accountable through clear objectives and measures that align to the strategic plan. 4. Make sure that the organisation has the right capabilities in place, through recruitment if necessary, and that individuals are provided with the training and development to do what is expected of them. Finally, it should be recognised that implementing strategy well requires much more than just process and management skills; it requires leadership, to win hearts as well as minds. In other words, it’s not only what you do, it’s the way that you do it!